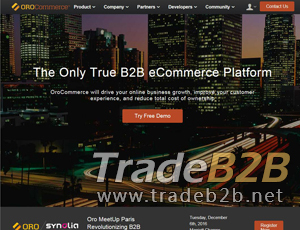 OroCommerce.com is an open-source B2B commerce platform that is designed to easily integrate with systems such as ERP, CRM and product information management. OroCommerce.com will drive your online business growth, improve your customer experience, and reduce total cost of ownership. OroCommerce is another revolutionary product from the team that knows the blend of Commerce and Customer Management. We were the team that created the Magento ecommerce platform and we are committed to delivering a B2B eCommerce application that will disrupt the space. About Orocommerce.com - Open-source B2B commerce platform's recommend,only on behalf of the views and opinions about B2B Directory, if you have any suggestions , please feel free to contact with us, we will amend and correct them in the first time according your suggestions. More better B2B Websites recomend, Please click here.